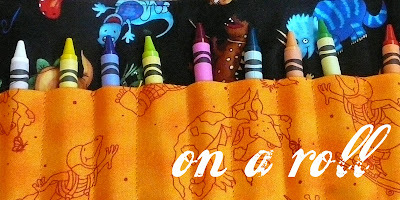 We found an adorable crayon roll tutorial from Skip to My Lou for today's back-to-school project. Love the ric rac she used! This project is so simple and can be made with scraps you already have piling up somewhere, or from a piece of sturdy wool felt. Stacy got busy and made one up for Jessica's boys to take to church. With all the crayons and colored pencils on sale right now, it's the perfect time to make a few of these and fill them up for easy gifts! Nested has a similar tutorial for crayon rolls. And check out the cool colored pencil roll by oh fransson where each color has it's own spot via matching fabric. Now that's a project for those of you with serious scrap collections! Greetingarts featured a darling version from this pattern as well. (Thanks for sharing your pictures!) I think I'll try a Velcro closure on this one for my little guys who can't tie a bow yet. So many great ideas for your little artists! Back-to-School posts with your blog address! Good luck! Another fun back to school idea - I love it! I love this crayon roll tutorial. I made one for a birthday gift and my daughter was so proud. 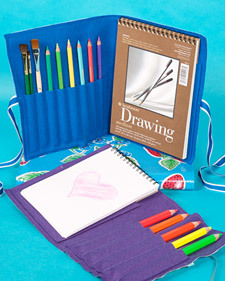 I haven't seen the artist's organizer, great idea. You keep coming through for us. that looks fun! I bet my son would love taking the crayons in and out as much as he loves coloring! I'm totally going to make a few of the crayon rolls for gifts for neices and nephews. I'm not that great at sewing, but thankfully these are all strait lines. :) Thanks for sharing the idea. Oh, very cute artist rolls! My kids would love the one with the pads of paper because we always getting stuck places waiting and they like to draw. They usually have to make do with my blank notebook and some colored pens I Have. Thanks for visiting me on my SITS day Monday! I've been trying to psyche myself into trying this tutorial for a few weeks now. This is great, I've been wanting to make these for my sons - they'll love em! Thanks for sharing!